Winston Churchill described the Battle of Britain pilots as "these splendid men… who will have the glory of saving their native land". But they weren't all British. A new film, Hurricane, tells the story of the Polish pilots of 303 Squadron - and also highlights the brilliance of an often-overlooked Czech flying ace, Josef Frantisek. He was "remarkable - some thought a little crazy", wrote the historians Lynne Olson and Stanley Cloud. A Czech "who flew with a fury none of the others could match". Josef Frantisek has been credited with shooting down 17 enemy aircraft in one month at the height of the Battle of Britain - September 1940 - as Hitler sought to achieve the air superiority he needed to invade the UK. The Imperial War Museum calls Frantisek the "top scorer" of the Battle of Britain, and he is generally considered to be one of the top scorers of the entire war, despite his death in its very early stages. Beyond the statistics, however, Frantisek remains an elusive figure. "His aplomb in the sky is documented, of course, but not much else," Hurricane's director, David Blair, tells me. But Blair says he became fascinated by Frantisek - a "lone wolf" pilot who kept breaking away from the squadron to chase enemy planes on his own - and worked hard to discover more about him. "I like his freedom and wildness, his romantic attitude," says Czech actor Krystof Hadek, who plays Frantisek in the film. "He didn't have discipline - but he was the best." So how did he end up in Northolt, west London, flying with a squadron of Poles? Frantisek was born in 1914 in a village that became part of Czechoslovakia after the collapse of the Habsburg empire. He was a boisterous child, driving cars from the age of 12. But after training in the Czechoslovak air force he had to watch in huge frustration as that country's military was ordered not to resist Nazi invasion in 1939. Driven by what his mother called a "deadly hatred" of the Nazis he escaped across the border to Poland and started flying for the Polish air force but witnessed defeat later that year against overwhelming German power. Stories of Frantisek flying low in primitive planes to drop hand grenades on German units hint at his seemingly reckless courage against daunting odds. He fled Poland after its defeat and eventually made his way to France where he managed to fly in combat for exiled Polish and other units. Then, after the fall of France in June 1940, he headed for Britain, where he joined the RAF and the new Polish 303 Squadron. Frantisek chose to fly with the Poles because he admired their fighting spirit, but his Czech origins reinforced his status as something of an outsider. Another pilot in the squadron remembered Frantisek as tall, well-built but "sometimes a bit absent-minded, as if shrouded in a strange sadness". With their previous combat experience and burning desire to avenge what Nazi invaders were doing to their countries 303 Squadron's pilots longed to begin active RAF service. But their Canadian and British commanding officers were wary of the pilots' lack of English language skills, experience of radio communication and tight-formation flying. It was a situation guaranteed to frustrate Frantisek in particular - constantly challenging and exasperating authority throughout his career. But Frantisek's formidable flying skill was what counted when 303 Squadron was finally given permission to enter combat, at a time when the RAF, facing a growing Luftwaffe onslaught, was desperately short of trained pilots. Claims of enemy "kills" are a much-disputed area - researchers have found that Allied and German statistics do not match - but Frantisek's achievements certainly gave him one of the highest personal scores of any Battle of Britain pilot in Fighter Command. Image caption Josef Frantisek, "shrouded in a strange sadness"
Why was he so successful? Peter Devitt from the RAF Museum in London points to his willingness to fly close to the enemy before opening fire. His courage, says Devitt, like that of the Polish pilots around him, may have come from a sense of having "nothing to lose" given what had happened to his home country. But Devitt also points out that 303 Squadron lost fewer pilots during the Battle of Britain than most RAF units. Frantisek submitted his own laconic reports of his successes. On one action against a vastly superior German force he wrote of "swarms of Messerschmitt 109s diving to attack us" after which he "played hide and seek with them in the clouds", nearly collided with a German bomber and then shot down two enemy planes in a few minutes before he was hit. But north-east of Brighton he "found a cabbage field and made an excellent landing". What marked Frantisek out was his habit of breaking away from strict squadron formation to chase enemy planes on his own, often pursuing stragglers back across the Channel towards France. The Poles flew and fought as a team, and some of his comrades resented what they called "Frantisek's method". 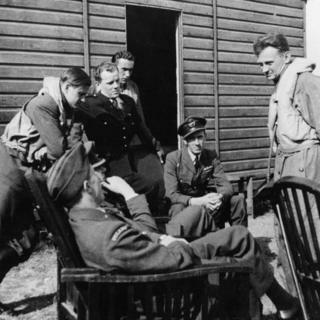 RAF and Polish officers in the squadron initially criticised his lack of discipline, arguing that it endangered everyone's safety. There was also a fear that younger pilots would seek to emulate him. But as his successes grew, there came about what Devitt calls a "remarkable compromise". Frantisek was given permission to take off with 303 Squadron as a kind of "guest" who could head off on his own. "The Czech ace was permitted to fight what was in effect a private war against the Germans," Devitt says. The squadron's impressive record did not go unnoticed. "Had it not been for the magnificent material contributed by the Polish squadrons and their unsurpassed gallantry," wrote Air Chief Marshal Sir Hugh Dowding, head of RAF Fighter Command, "I hesitate to say that the outcome of the Battle (of Britain) would have been the same." King George VI visited 303's Northolt base near London, and the Polish and Czech airmen were feted in the media. But within weeks there was a final, characteristically mysterious twist in the Frantisek story. The pilot who had survived so many hours of hazardous combat was killed in on 8 October 1940 after he broke away from his squadron and then apparently crash-landed in a field in Surrey. His aircraft flipped over and he was killed instantly. Rumours quickly circulated that suggested a death more befitting a romantic hero - that he had perhaps been performing low level acrobatics showing off to a girlfriend. But the reality is likely to have been more mundane - lack of fuel, exhaustion perhaps, a final, fatal misjudgement. Frantisek's life reminds us that the Battle of Britain pilots, symbols of extraordinary courage, faced enormous levels of physical and mental stress. It seems clear that he was plagued by anxiety and inner demons. One contemporary account of 303 Squadron by a Polish writer, said of Frantisek: "There was something truly moving, worthy of the deepest compassion, in the way this young daredevil, who took off against the enemy with the greatest of dash… was afraid of the Earth when he returned to the safety of his base." Shortly after Frantisek's death Hitler acknowledged that air superiority over the RAF had not been established, and the planned invasion of Britain was postponed indefinitely. And once the Battle of Britain was won the memory of pilots like Frantisek faded swiftly - as did the memory of the many from other nations, including Canada, New Zealand, and Caribbean states who had contributed hugely towards the RAF's "finest hour". After the war, the Polish pilots felt their country had been betrayed to Soviet communism. And they were not included in victory celebrations in Britain, nor in war films celebrating RAF heroism. Other Polish contributions to the war effort - such as vital work in the cracking of the German Enigma code - went similarly unacknowledged. Meanwhile Polish and Czech ex RAF pilots who returned to their own countries often suffered terribly at the hands of new communist rulers who regarded them as imperialist agents tainted by their Western links. "They were treated as spies, it was so unfair," says Czech actor Krystof Hadek. Only since the end of communist rule has their memory been honoured. Frantisek's memory survived in Britain among a few who discovered what he had achieved. In 2011 the Wolf Brewery in Norfolk brought out a Lone Wolf beer in his honour. Others have researched recently where exactly he died - now the site of a nature reserve near Ewell in Surrey - and want to create a memorial for him there. Frantisek is not the central character of the new film, Hurricane, but director David Blair says he "didn't want him just making up the numbers". "I wanted to work on him 'growing' on the audience (and the Poles) and making the sense of loss all the more palpable by the end."